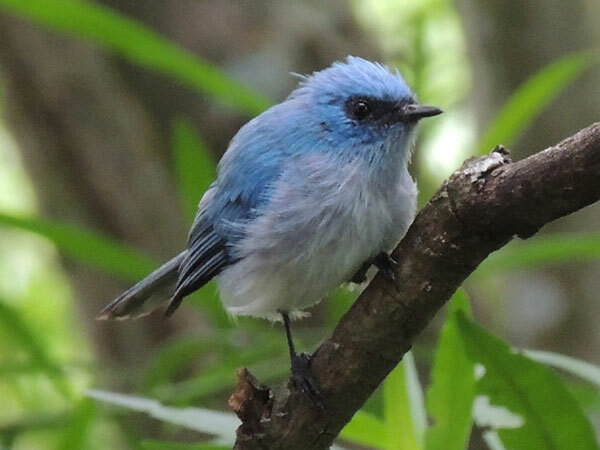 These small, active birds are present in moist habitats from Kenya and Uganda as well as elsewhere in Sub-sahara Africa. The fine bill is suited to capturing small, mostly soft-bodied insects, both in flight and gleaned from exposed foliage. The tail can be fanned open and the birds frequently do this together with open wings as they alight after capturing prey or re-orient as they scan about for insects or conspecifics. In several cases I have found African Blue Flycatchers hunting very close to a latrine! Flies and maybe mosquitoes seem to be an easy prey in this way. Copyright Michael J. Plagens, page created 14 June 2013.